Local Health Integration Networks (LHINs) have become lightning rods in many communities. The Hamilton Niagara Haldimand Brant LHIN was the focus of a scathing Ontario Ombudsman report “The LHIN Spin” which suggested public engagement was no more than lip service. The South East LHIN recently sent their local communities into a panic after it floated the idea of concentrating all surgeries in Kingston. The Erie St. Clair LHIN generated headlines last year when it unveiled plans to bring in a Disney speaker at a cost of close to $10,000. The speaking engagement was cancelled, although not the cost. Aside from a horrible name, the LHINs have made many blunders to turn Ontarians against them – at least among the citizens that are even aware they exist. In a February 2011 Vector Poll, only 22 per cent of respondents claim to have either heard or read something about LHINs. Vector has been polling this question since 2006 with barely a change in results. After a brief description of what the LHINs do, 77 per cent of Ontarians opposed shutting them down. More troublesome to PC leader Tim Hudak, 68 per cent of PC voters are opposed to his promise to kill the LHINs. If the LHINs are likely here to stay, how do we fix them? For starters, it’s about time the province come up with its overall strategic plan. It was supposed to be the guide for the LHINs to develop their own regional integrated health service plans. Instead, the province has been flighty in its priorities, often changing from Minister to Minister. George Smitherman was all about aging at home. David Caplan was about mental health. Deb Matthews is focused on getting alternate level of care patients out of hospitals. Secondly, the LHINs are likely too small and have too few professional staff to effectively carry out their work. They like to crow about how small their administrative costs are relative to funding they shell out to hospitals, long term care homes, home care and other health providers, but it may be unreasonable. The Ministry has added to the workload with additional performance indicators and a broadened scope of oversight, but it refuses to allow the LHINs to hire appropriate staff to get the job done. This may have something to do with point three – the LHINs have been very focused on reigning in costs, mostly at hospitals. 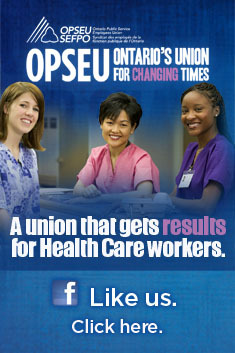 It would be political folly to add to the LHIN administration while front line health professionals are being cut. This was supposed to be an exercise about quality, but clearly the focus has been on cost. One hospital CEO showed up at a LHIN board meeting to discuss progress on his hospital’s improvement plan. Missing from his presentation was information about the hospital’s performance on the LHIN’s quality indicators. To their credit, Ontario hospitals are in a far better place financially today, but it may be at a cost in quality. The LHINs were supposed to take their strength from the communities they served, but no community has really warmed up to them. A few years ago OPSEU was invited to participate in a panel discussion on the LHINs by the Rural Ontario Municipal Association (ROMA). When the floor opened for questions, Mayors and Councillors of small towns lined up at the microphone to vent their frustration with the LHINs. The mayors felt the LHINs were unaccountable and were carrying out a hatchet operation on their local hospitals. When a matter of concern comes up on the LHIN board’s agenda, often communities show up in considerable numbers. The LHINs lack any mechanism for representatives of these communities to address their concerns directly to the board. Recently two LHINs opened up their board meetings to deputations, although the process at Central East may be far too onerous and controlling to ever work. When the LHINs did hold events for public consultation, these events often involved round tables with facilitators and set question lists. Many who have attended these events found the process manipulative. When OPSEU took the Central East LHIN before judicial review in 2008, the lawyers for the government argued the LHINs were only responsible for high-level consultation, not on specific changes. In other words, the LHINs could ask what kind of health services a community might want, not on whether 20 mental health beds should be shut down at their local hospital and moved to another community. It’s these specific initiatives when the public is most engaged, and it is these moments when the LHIN shuts them out of the process. There are signs the LHINs are beginning to learn from their mistakes. At a recent Central East LHIN meeting they said they looked at integration between two addiction services and realized that while cooperation between the two of them was encouraged, it didn’t make sense for them to merge. The LHIN also acknowledged that Lakeridge Health was a good place to host one of these two services – a radical departure from the LHIN’s early days when it seemed they couldn’t move services out of hospital fast enough nor convince enough providers to integrate. This is the same LHIN than asked hospitals to set aside 1 per cent of their budget to allocate to a community-based health provider while trying to maintain it was making evidence-based decision-making. There is a value to have a process by which health care providers must justify changes in service delivery. The Southwest LHIN recently put the breaks on a plan by Grey Bruce Health Services to jettison speech language therapy for preschoolers. The hospital made the announcement under a hope and a prayer that the Health Unit would be able to pick up the work. The LHIN has since written to the hospital asking them to submit a formal integration proposal. Such a proposal will require more than a hope and prayer in the transfer of a service — it will need a HR transition plan. The South West also responded to complaints that the Regional Mental Health Centre in London and St. Thomas was cutting beds without providing appropriate alternate services in the community. The LHIN allocated another $2.9 million for community delivery of mental health as a result. It won’t be nearly enough, but at least there was evidence they are listening. It is far more productive to start talking about what the LHINs or their replacement might look like rather than take an axe to it all as Tim Hudak proposes. Diablogue will write more on this in the weeks to come. This entry was posted in Local Health Integration Networks and tagged Central East LHIN, Erie-St. Clair LHIN, LHIN community engagement, LHIN criticism, LHINs, Local Health Integration Networks, OPSEU, South West LHIN, Tim Hudak. Bookmark the permalink. The LHINs need an axe. They are populated by lawyers and accountants and have done nothing but add another level of buerocracy to a system that was already over run with it. They are not too small, and since there was no significant budget decrease in ministry budget lines for staffing when they were formed they have not replaced they have added to the admin cost of health care, a system which continues to be top heavy and has far too many supervisors while nurses and other front line staff are and continue to be cut. There is nothing suggested in this that would fix the LINs an d growing something whose fundamental reason for being is flawed will only make it worse not better. The LHINs were formed to cut Health Care costs and insulate government from the blame. They are cutting hospitals, and are now aiming at Community access centres and community programs. Facilitated integration is just the latest buzz word for cut and the LHINs have done far more chopping to this system under the liberals than Mike Harris ever did. You forget that seven regional offices were closed down when the LHINs were formed. That’s on top of rolling up 16 District Health Councils. Are you suggesting that all decisions about changes to health delivery should be made centrally from Toronto?